Three years ago, Reporter sat down with first year Biomedical Science major Sarah Szybist after she claimed the title of Liberty League’s "Rookie of the Week" on multiple occasions. At the time, she was tied for the ninth spot in the nation for kills per set in NCAA Division III. Now, with over two thousand kills, Szybist has surpassed Tracy Wilt to become RIT volleyball’s record holder in career kills. “I never expected that I would become the all-time leader in kills,” said Szybist. Her coach, Jim Lodes, expressed his praise for Szybist on her feat. “I’m most impressed that Sarah has achieved surpassing Tracy while placing the team and its goals first,” he commented. “She has always been willing to do whatever it would take to help the team. Her role each season as an attacker has evolved and she has embraced the ‘team first’ mentality while being prepared to do her part. I couldn’t be more proud of her with this achievement." “I’ve really enjoyed working with this group,” added Lodes. Szybist attributes some of her success towards Lodes, as she was able to achieve everything he said that she would achieve in her four years at RIT. In our 2013 article, Lodes predicted that “She has the potential to be very decorated.” He also believed she could be "all-conference, hence the awards so far, but she can also be all-region. She’s gifted enough to be All-American." Lodes projections came to past — during her time here at RIT, Szybist has received three straight AVCA Honorable All-American honors as well as her three straight AVCA All New York Region selection. Szybist has trouble believing that she was truly able to complete all the expectations that Lodes set out for her freshman year. “It’s still hard to believe that I have achieved everything that he believed that I could; that’s one of the reasons why I chose RIT,” she explained. 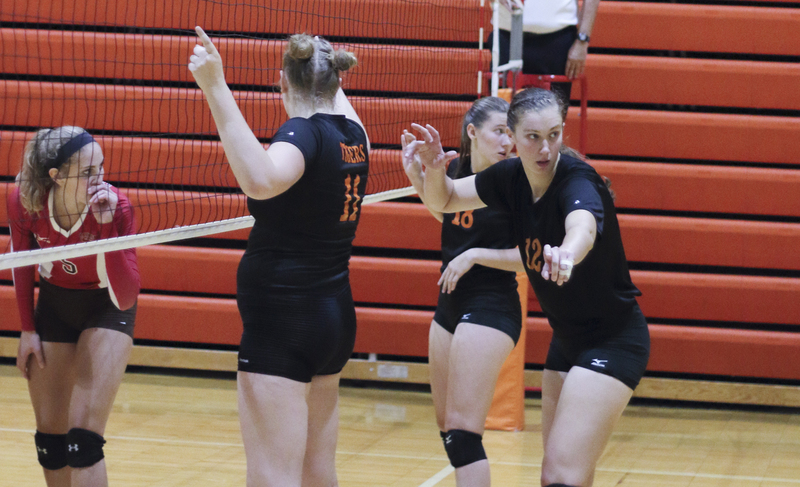 The volleyball team recently held a Liberty League tournament here at RIT at the Clark Gym this previous weekend, and Szybist was happy with the results. The Tigers won three games out of four, with two of their games being in won in three straight sets against St. Lawrence University and Bard College. This allowed them to begin their conference record with a 3-1 winning record. This being Szybist's final season, she hopes the Tigers can become Liberty League champions and compete in the NCAA tournament at the end of the season. While Szybist's journey at RIT is drawing to a close, Lodes is optimistic for the future of the program. “Sarah will not be easy to replace, but I expect that we will be up to the task of finding our new identity when the time comes,” added Lodes. Catch Szybist and her teammates in action as they host the RIT Invitational this Friday and Saturday, September 13 and 14. With back to back games against Utica College, Trine University, St. John Fisher College, and Desales University, this weekend promises to be a thrilling one. Come out and support our Tigers as they make history on the volleyball court!